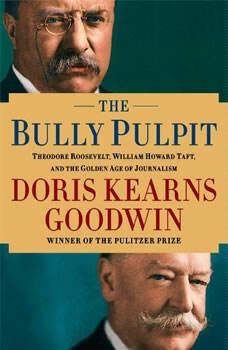 After Presidents Franklin D. Roosevelt and Abraham Lincoln, Doris Kearns Goodwin wields her magic on another larger-than-life president, and another momentous and raucous American time period as she brings Theodore Roosevelt, the muckraking journalists, and the Progressive Era to life.As she focused on the relationships between Franklin and Eleanor Roosevelt in No Ordinary Time, and on Lincoln and his Team in Team of Rivals, Goodwin describes the broken friendship between Teddy Roosevelt and his chosen successor, William Howard Taft. With the help of the “muckraking” press—including legendary journalists Ida Tarbell, Lincoln Steffens, William Allen White, and editor Sam McClure—Roosevelt had wielded the Bully Pulpit to challenge and triumph over abusive monopolies, political bosses, and corrupting money brokers. Roosevelt led a revolution that he bequeathed to Taft only to see it compromised as Taft surrendered to money men and big business. The rupture between the two led Roosevelt to run against Taft for president, an ultimately futile race that resulted in the election of Democrat Woodrow Wilson and the diminishment of Theodore Roosevelt’s progressive wing of the Republican Party. Like Goodwin’s chronicles of the Civil War and the Great Depression, The Bully Pulpit describes a time in our history that enlightened and changed the country, ushered in the modern age, and produced some unforgettable men and women.